Reading Achievement Certificates are given to student who have shown outstanding work in their reading skills. 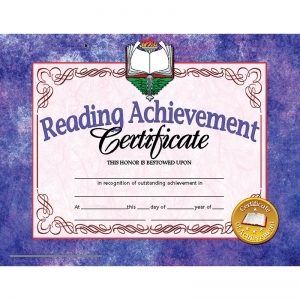 These Hayes achievement certificates feature a blue marbled paper background with a book like look to the certificate image. These certificates will be a keepsake for years to come. 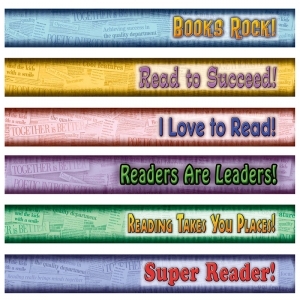 These reading awards are great to give out at end of the school year and award ceremonies. 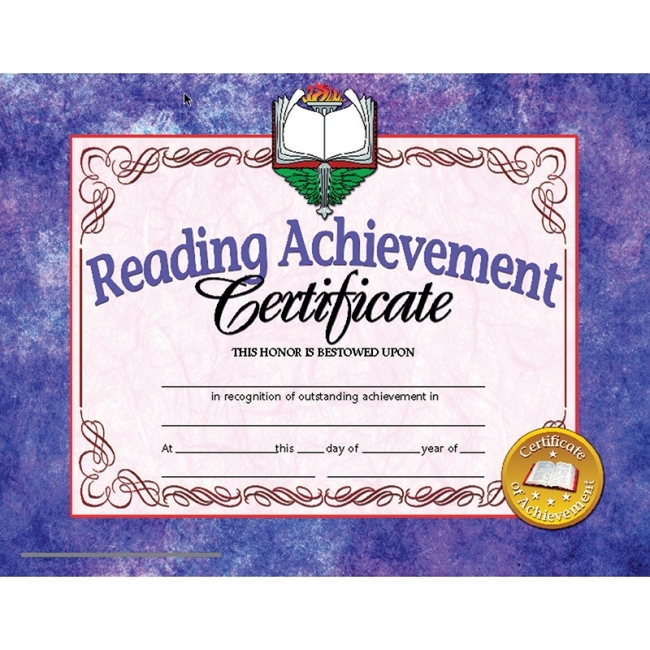 These blank achievement certificates can be personalized with a downloadable template. Measures 8.5" x 11". 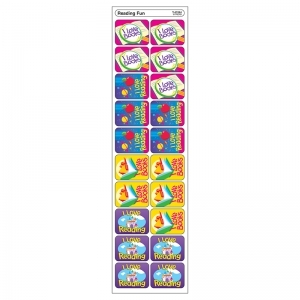 Each pack includes 30 diplomas. 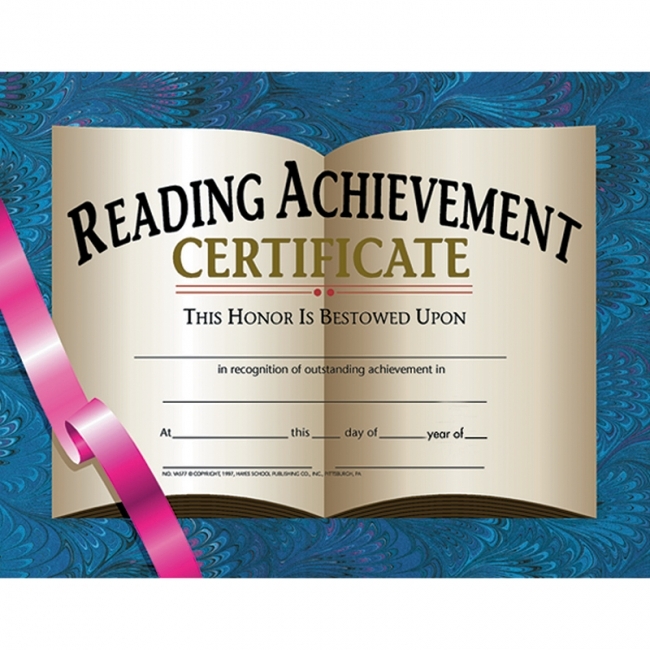 Certificate reads: Reading Achievement Certificate This Honor Is Bestowed Upon _____ in recognition of outstanding achievement in _____ At _____ this _____ day of _____ year of _____. 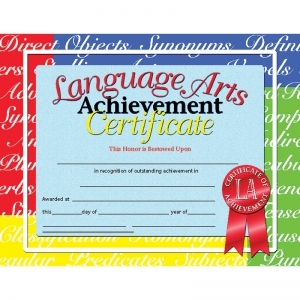 Beautiful, authentically designed Hayes certificates printed in full color on high quality paper, will become a keepsake from that special day for years to come. 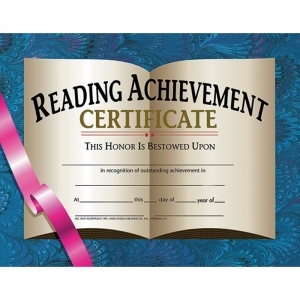 Certificate reads: Reading Achievement Certificate This Honor Is Bestowed Upon _____ in recognition of outstanding achievement in _____ Awarded at _____ this _____ day of _____ year of _____. 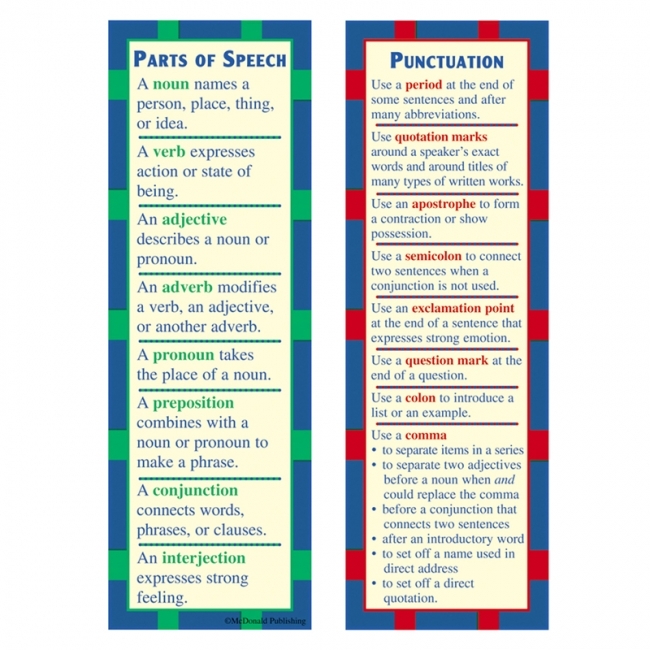 Downloadable templates available to personalize or can be handwritten. Inkjet or laser printer compatible. 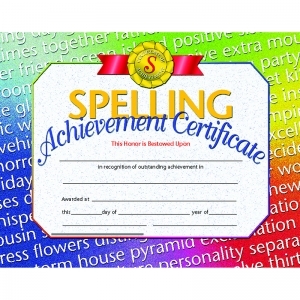 Certificates measure 8.5" x 11" and come 30 per pack. 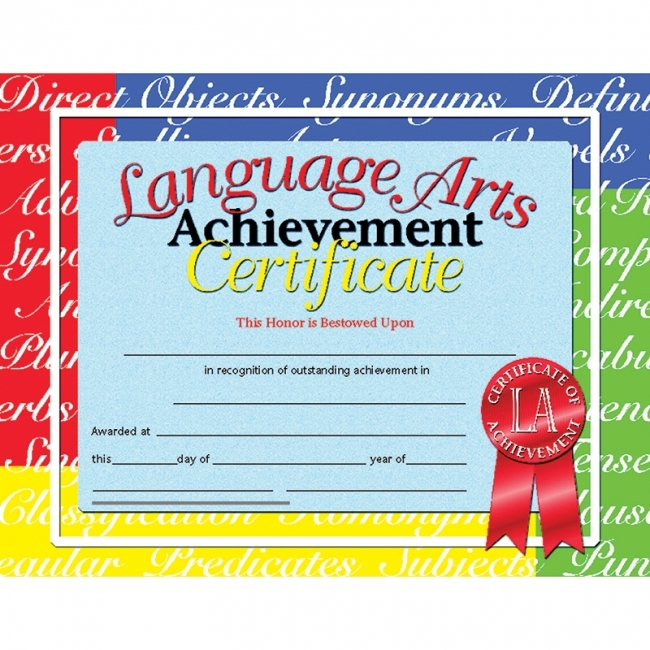 Language Arts Achievement Certificate features a colorful design that is printed in full color on high quality paper. These Hayes certificates are great to honor student who have outstanding achievement in language arts class. 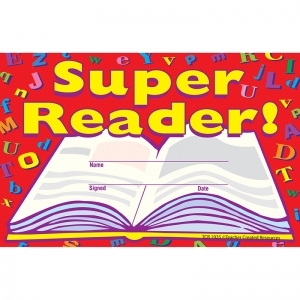 Teachers and administrators can give these out at end of the school year parties and award ceremonies. 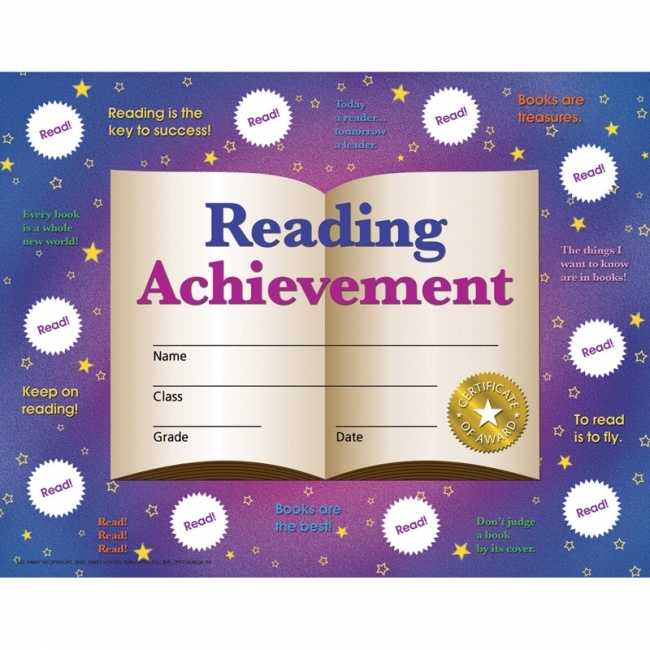 These LA achievement awards can be personalized with the student's name and other information pertaining to the award. 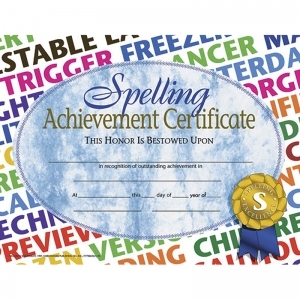 The certificates can be handwritten or printed by using a downloadable template. Measures 8.5" x 11". Each pack includes 30 diplomas. 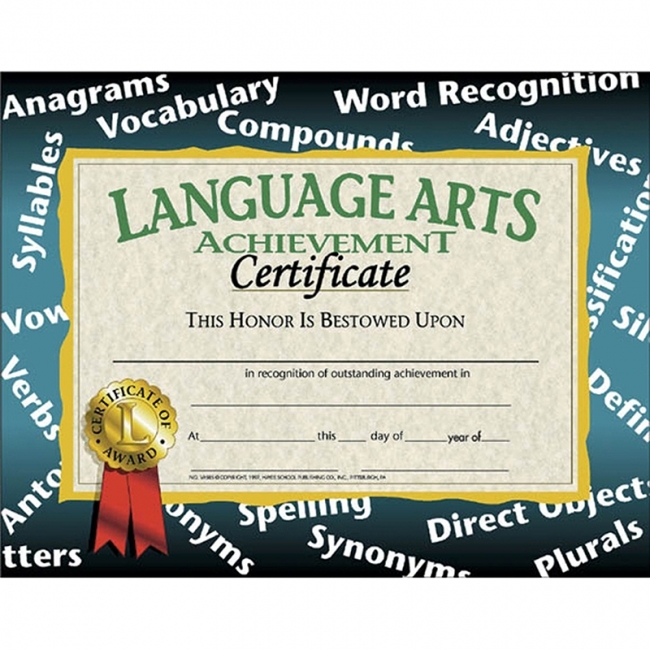 Certificate reads: Language Arts Achievement Certificate This Honor is Bestowed Upon _____ in recognition of outstanding achievement in _____ Awarded at _____ this _____ day of _____ year of _____. 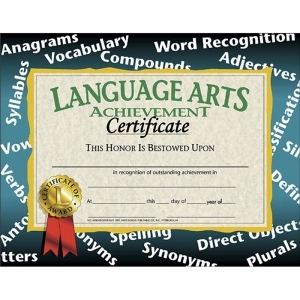 Recognize your student's academic success with Hayes Stick-to-it Certificates. Hayes Stick-to-it Certificates motivate a high level of effort from students as they watch their accomplishments grow by adding reward stickers to their certificates. This positive effort is sure to lead to greater success. 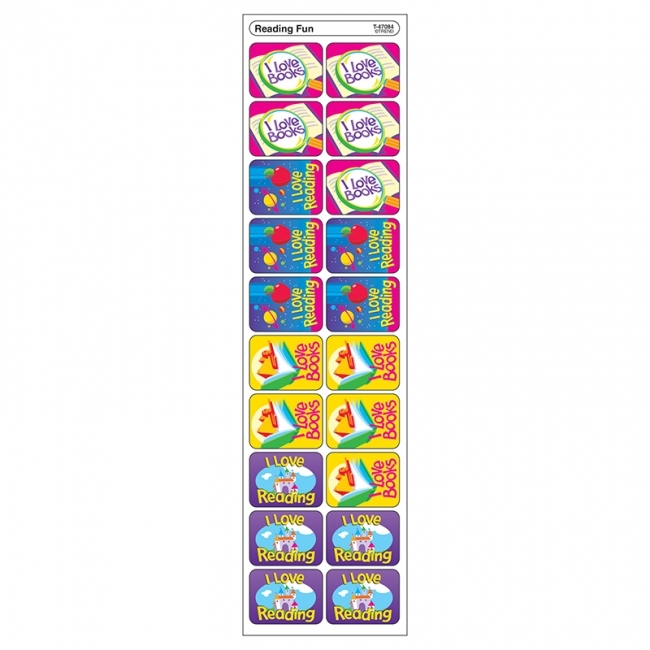 Stick-to-it Certificates are perfect for displaying in the classroom and for positive communication from school to home. Students will take great pride and more independence in their achievements as they strive to fill up their certificates. 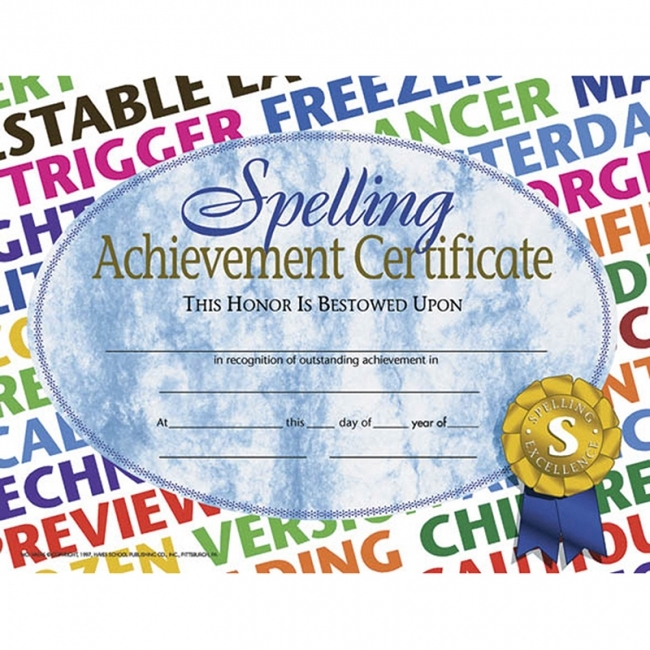 These proud feelings will continue when the students receive their personally completed certificates to keep as a reminder of their accomplishments. 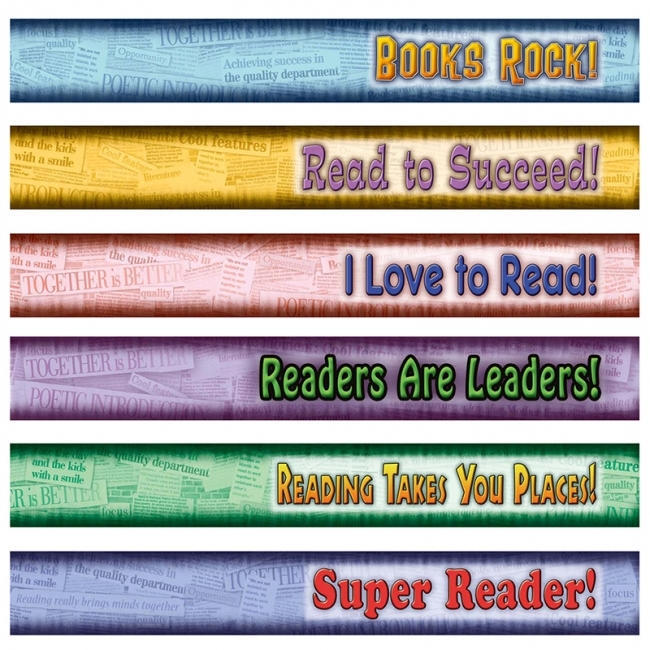 Students will "stick to" their goals with Hayes Stick-to-It Certificates! 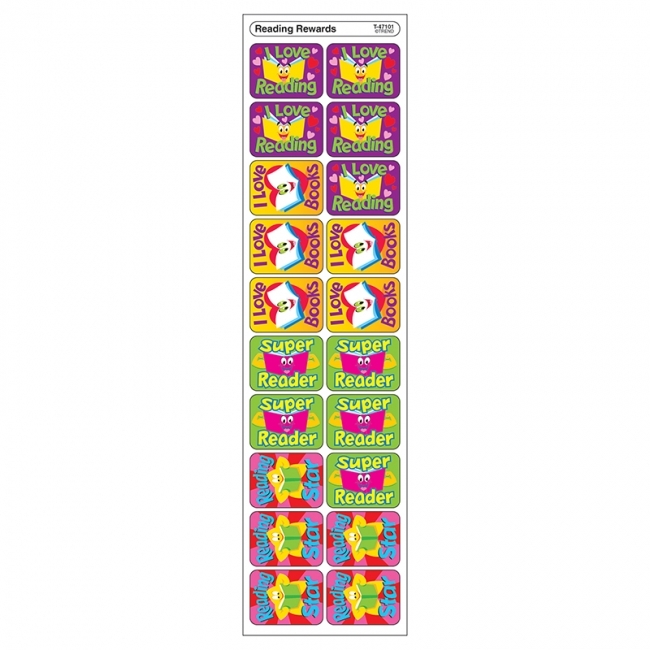 Includes 30 Reward Certificates, 320 Reward Seals, and an Instructor's Guide. 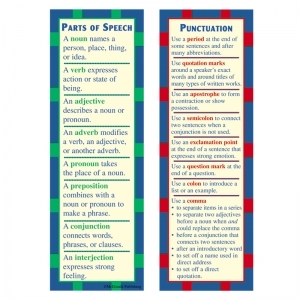 This handy two-sided bookmark defines the eight parts of speech and explains the main uses of periods, quotation marks, apostrophes, semicolons, exclamation points, question marks, colons, and commas. 36 bookmarks per package. One side of this colorful two-sided bookmark lists and explains the six steps of the writing process. 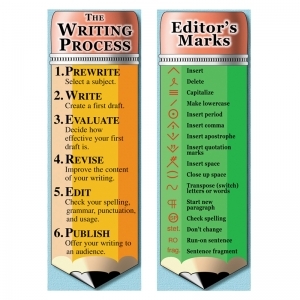 The other side shows 16 editor's marks that make checking one's writing easier and faster. 36 bookmarks per package. Bright colors, whimsical artwork, and fun phrases catch kids' attention and motivate them to reach goals. Arm Charms are ideal for celebrating a special occasion, rewarding individual or class achievements, encouraging good behavior, or simply brightening up the day! Each package contains 72 paper bracelets measuring 8 1/2'' x 7/8'' (21.6 x 2.2 cm), plus 72 clear adhesive seals to secure the bands around the wrist.